Jack Hoban was shaped by service in the U.S. Marine Corps, a life-changing epiphany at a Cold War bar, and mentorship under two masters: The 34th generation grandmaster of the shadowy art of the Ninja and a sage of the Natural Law who may just have deciphered the meaning of life. He now delivers a revolutionary view of moral values for our time epitomized by the Ethical Warrior – protector of self and others as equal human beings. Hoban’s methodology reaches from the Greek ancients to the counterinsurgency efforts of today’s Marines to provide ethical clarity and confidence in our moral actions. Written as a companion to the actual training, The Ethical Warrior is of great value to those interested in living a balanced, happy and ethical life. 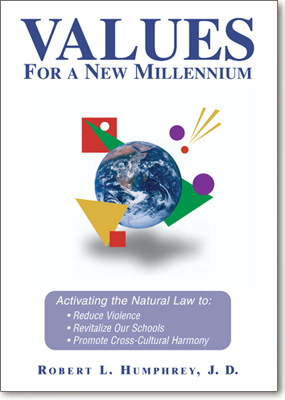 It addresses important questions such as: Is there a “true north” on the moral compass? Is there an objective value that can be used to qualify our relative values as moral or immoral? How do we reject our tendency to dehumanize others not of our “in-group”– including our enemies – and respect true human equality? How do we do “the right thing” under the stresses of everyday life? How do you teach values? How do you keep yourself and others motivated and positive under the stresses of everyday life, not to mention the rigors of combat as a U.S. Marine? “Not with lectures, that is for sure,” says Joseph “Joe Marine” Shusko. 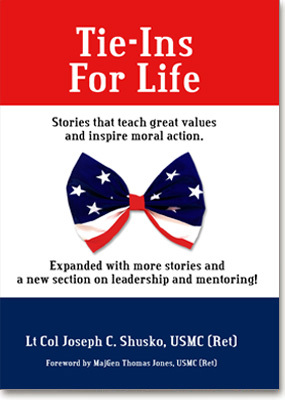 Joe Shusko has mentored hundreds of Marines, police officers, and regular folk with great success for over thirty years. His secret? He tells them stories that inspire moral behavior and an enthusiastic perspective on life. He calls these stories “tie-ins” because they do more than make you feel good, they are a call to moral behavior. “Ethics,” says Joe, “are moral values in action. I typically give a ‘tie-in’ to my students after we have done some physical exercise together, especially martial arts training. This allows me to ‘tie’ a moral lesson to the physical action in order to develop Ethical Warriors.” Now he has written down his collection of world-famous tie-ins for anyone and everyone to enjoy. Pick up the book, open to any page, and feel a moral rejuvenation! General Charles C. Krulak, 31st Commandant of the United States Marine Corps: "Whether on the Battlefield or in the Boardroom, a strong value system is the most precious weapon of all. Nobody understood this more than Bob Humphrey. I cherish the time I spent with this remarkable man and count myself as blessed to have been under his tutelage." William S. Sessions, former Director of the Federal Bureau of Investigation: "Professor Humphrey's fresh look at human nature gives us insights and methods to break down walls between groups in conflict which can impact and help reduce cross-cultural violence." Colman Genn, Center for Educational Innovation and former Superintendent, New York City School System: "Bob Humphrey's Life Values theory represents the clearest and most satisfying explanation of human nature in the last three thousand years of philosophy." 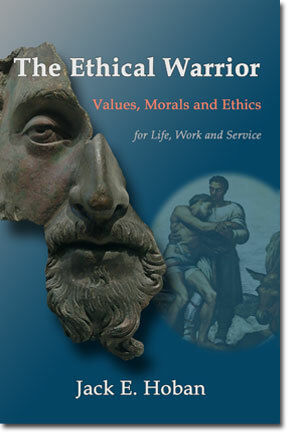 The Ethical Warrior concept was developed and is practiced by the United States Marine Corps. It is transmitted to the Marines through the Marine Corps Martial Arts Program (MCMAP). 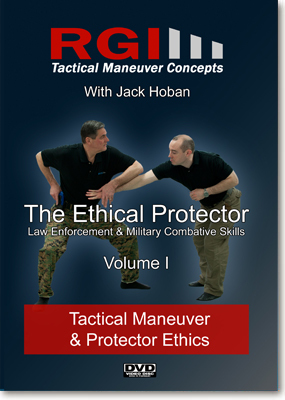 The concept has been adapted for Law Enforcement and is referred to as the Ethical Protector concept. 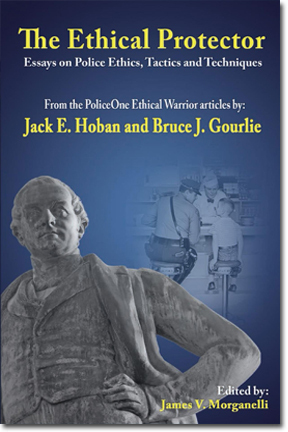 This book is adapted from a series of articles written originally for LEOs on PoliceOne.com, but be assured, the lessons herein are timeless and immutable. They can, have, and will grant us clarity. Clarity for the protector in all of us. The authors' wisdom and talent to deliver these lessons is unsurpassed. Bruce Gourlie is a Federal Supervisory Special Agent, certified in firearms and Police instruction. He is a leadership instructor, a published author, a former US Army infantry officer and a long-time practitioner of martial arts. Jack Hoban is a Subject Matter Expert for the Marine Corps Martial Arts Program and president of Resolution Group International (RGI). He had the privilege of being mentored by Dr. Robert "Bob" Humphrey, a Natural Law sage and Cold War conflict resolution expert, who first articulated the Dual Life Value Theory. Jack also is a long-time student of Japanese martial arts master Masaaki Hatsumi, and under Dr. Hatsumi's tutelage, has become a true adept of the martial ways. Whether you are a law enforcement officer, military operative, or citizen protector, violent confrontations call for a high level of tactical and technical competence as well as ethical clarity. 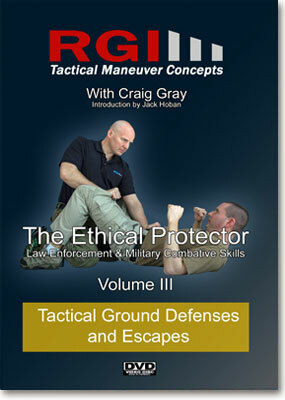 In this video Craig Gray and Andy Veen demonstrate essential tactical ground defenses. Learn how efficient body positioning and maneuvering can help you escape the most common ground attacks, giving you the critical tactical advantage needed to effectively control these volatile and dangerous situations. 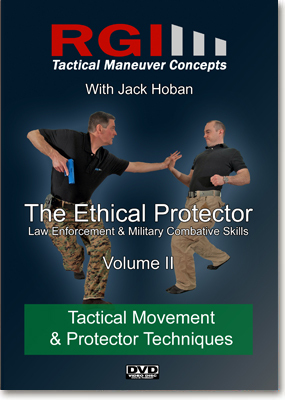 This video also emphasizes the essential connection between the tactical movement and ethical conduct that keeps everyone safer. The RGI ethical-tactical approach stems from "The Dual Life Value," which guides the Ethical Protector to protect the life of self and others, even the person who is behaving violently. As an added bonus, you will hear Jack Hoban describe the foundation of RGI Ethical Protector Philosophy, human equality, and tell "The Hunting Story." Craig Gray is a speaker, trainer and Subject Matter Expert (SME) for numerous law enforcement agencies, security departments, healthcare providers and schools. Craig created the MCOLES (Michigan Commission of Law Enforcement Standards) approved Self Defense for Law Enforcement Training Program and was an adjunct instructor for hand to hand combatives and ethics at the Homeland Security and Protective Services Academy within the Gerald R. Ford Job Corps. Craig is also a Verbal Defense & Influence Advanced Instructor and an Associate at Resolution Group International, a conflict management company. Whether you are a law enforcement officer, military operative, or citizen protector, verbal conflict resolution skills are essential. They call for a high level of tactical and technical competence, as well as, ethical clarity. 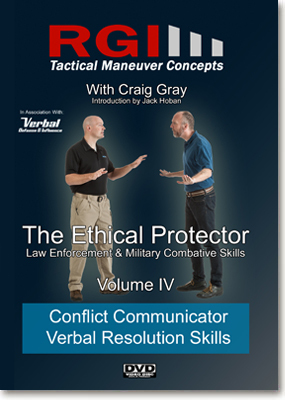 In this video Craig Gray will introduce essential conflict communication skills. You will learn a proven format that will increase your self-confidence and effectiveness when dealing with verbally noncompliant individuals, and how to turn adversaries into allies. This video also emphasizes the critical connection between verbal skills, tactical movement and ethical conduct that keeps everyone safer. The RGI ethical-tactical approach stems from "The Dual Life Value," which guides the Ethical Protector to protect the life of self and others, even the confrontational person, when possible. Produced in association with Verbal Defense & Influence. Craig Gray is a speaker, trainer and Subject Matter Expert (SME) for numerous law enforcement agencies, security departments, healthcare providers and schools. Craig created the MCOLES (Michigan Commission of Law Enforcement Standards) Self Defense for Law Enforcement Training Program and was an adjunct instructor for hand to hand combatives and ethics at the Homeland Security and Protective Services Academy within the Gerald R. Ford Job Corps. Craig is also an Advanced Verbal Defense & Influence Advanced Instructor and an Associate at Resolution Group International, a conflict management company.